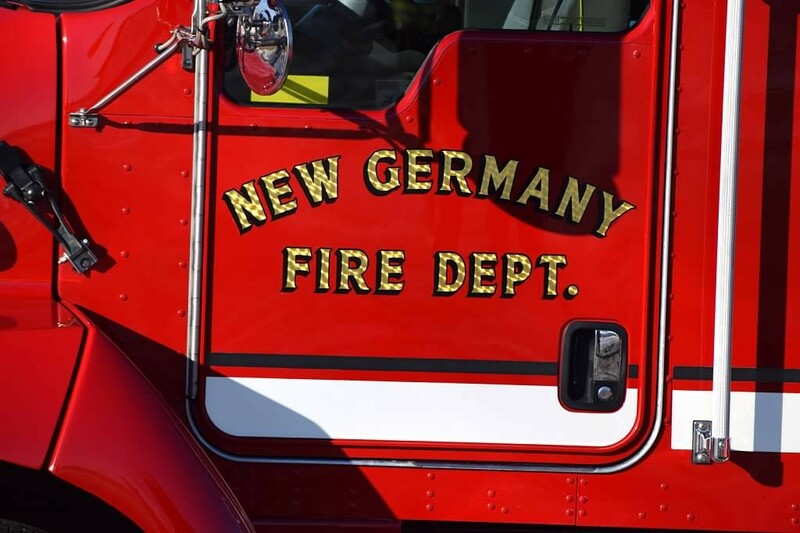 Since 1901, the New Germany Fire Department has provided service, loyalty, and protection to the city of New Germany, as well as the surrounding townships of Camden and Hollywood. The volunteer department currently has 25 active members (those who are firefighters and first responders), and five rescue reserve members (those who are available during the day and can be either first responders, firefighters, or both). Anyone who lives or works within the fire protection zone served by the department is eligible to volunteer for membership. Physical and other requirements must be met. Contact any fire department officer for more information on joining this honorable crew. Intense training is an important part of being a firefighter. All members of the department participate in regular ongoing training in a variety of areas. The department conducts one training meeting every month, and in addition to this, members participate in classes and training events throughout the year. One of the goals of the department is to make sure firefighters are always prepared to deal with the situations they may encounter. Today, training is more important than ever because the nature of fire fighting has evolved over the years. Equipment to fight fires has also evolved, and this is another reason that ongoing training is vital. Firefighters must be comfortable with and understand the equipment before they are called upon to use it at a fire scene. In 2014, the department purchased traffic safety equipment, including four hand-held lighted stop/slow signs, five lighted traffic cones, and traffic vests for each member. “The number-one chance of injury or death on any call is being hurt in a roadside accident in which the fire department member is struck by a vehicle,” Ruschmeier said. Two other newer pieces of equipment for the New Germany Fire Department include an automated external defibrillator (AED) – a portable device that checks heart rhythm and, if necessary, delivers an electric shock – and an AutoPulse, designed to perform CPR chest compressions automatically. Ruschmeier said he appreciates all the people who attended the 33rd annual firemen’s softball tournament the first weekend in August. In 2015, the event will take place July 31 through Aug. 2. Proceeds will be donated to the City of New Germany for the fire department retirement fund. Anyone who would like to volunteer can contact any member of the fire department. New Germany Fire Department past chiefs are the following: Conrad Neustel, 1902; JJ Schlecter, 1903-1907; Albert Groenke, 1908-1910; HD Mielke/Wm. Stender, 1911; Wm. Stender/Albert Groenke, 1912-1916; Wm. Stender, 1917-1919; Fred Hein, 1920; Gust Lohrke, 1921-1922; Fred Hein, 1923-1924; Oscar Trittabaugh, 1925; Hy Steinke, 1925; Herman Roepke, 1926-1933; Herman Briesemeister, 1934; Herman Roepke, 1935-1945; Albert Lueck, 1946; Louis Mielke, 1947; Ralph Stahlke, 1948-1965; Viron Roepke, 1965-1967; Harlan Wolter, 1968-1991; Steve Van Lith, 1991-2003; Bruce Fillbrandt, 2004; Steve VanLith, 2005-2012; Daniel Ruschmeier, 2013-present.